Set standards for all of your property developments using expertly crafted templates for Architectural Covenants, Building Guidelines, Design Standards, Landscape Requirements, and Conditions and Restrictions for quality Neighborhood and Community Real Estate Development. Developer Tools can be modified to fit your project needs and are provided as word processing files for Microsoft Word, Works, WordPerfect and most other word processing applications. 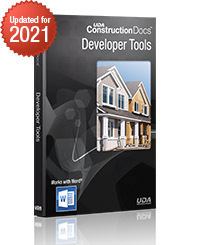 Developer Tools are part of the UDA ConstructionSuite family of products, and also available in ConstructionSuite Corporate and above.